A Bare Escentuals Double Liner eye set can help women create dozens of beautiful looks to play up their eyes for every season. This eyeliner tool includes a thin, pointed brush for delicate lines, and on the other end, a precision liner brush that creates a more dramatic and smoky look. This versatile double-ended brush can be used for both shadow and liner. On one end, a tapered contour brush provides smooth shadow coverage, while the pointed end is perfect for details, highlights, and liner application. This duo provides gorgeous, natural looks every time. The larger sweeping brush is perfect for sweeping shadow, while the opposite end offers a firm, angled brush for natural looking liner. Smoky V Eyes II: This tutorial and makeup set includes a Double-Ended Smoky V Brush, lavender gray highlight shadow, smoky violet glimmer shadow, and easy-to-follow instructions on creating the perfect smoky eyes. Animal Instincts Eye Set: The luscious kit includes three eye colors -- Wildcat Glimpse, Panther glimmer, and Tiger's Eye liner shadow -- along with the unique 'Foil and Define' double-ended liner and eye brush for creating wildly dramatic or subtly purrfect eye looks! Ponder Collection Eye Set: This collection of cool greens comes with a double eye shaping brush and adorable 'flower power' cosmetic bag to keep your escentuals organized. iQuad -- The Works: This eye set does not include a double ended brush, but does include two separate eye tools; the mini contour brush and the mini liner brush. The four versatile shadow liners can create a number of looks for any occasion and travels easily. Get Started Eyes Kit: This kit offers four neutral shadows and three eye and liner brushes for perfectly lined and defined eyes. The complete how-to-guide takes the guesswork out of creating beautiful eyes with mineral makeup. 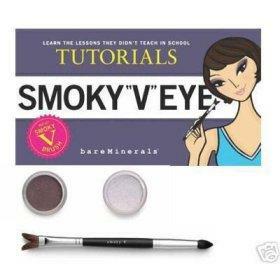 You may also find Bare Escentuals sets at online retailers such as Amazon.com.